Once we returned from the hike it was time to collect our food. As this was a special treat, everybody would be having cod and chips or sausage and chips from a local chip shop. Nearly everybody ate everything! After dinner, it was time to don our camp fire blankets and begin the camp fire. The weather was kind to us and we didn�t have any rain. After singing seven of our favourite camp fire songs it was time to go back into the hut. Up to this point, everybody had been wearing our very smart and traditional uniform, but now everybody would change into his or her onesie. There were some very spectacular examples, and even the scouters joined in. 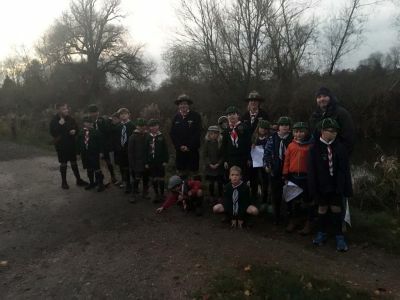 After we had got changed, it was at this point that we were honoured to have a visit from Grand Scout Master David Cooksley whom attended to join us with the film! We all set up our beds and then got ready to watch a film on the projector. The film would be the new version of the Jungle Book. Wolf Cubs is based on Kipling�s the Jungle Book and although the film doesn�t quite follow the same story it was still worth watching it. I particularly found the portrayal of Bagheera endearing. During the film the Cubs enjoyed popcorn and sweets. As you can see from the pictures, some cubs made themselves very comfy. After the film, it was time to say goodbye to the Grand Scout Master and then time for bed for the Cubs. In the morning, we had a short session of exercise and then a cooked English breakfast. The main activity for the day was to make the tallest tower out of spaghetti and marshmallows. We ended the sleepover with Grand Howl and such it was time to say goodbye to our new friends. Good Hunting Wolf Cubs. Remember, "the strength of the Wolf is the Pack. The strength of the Pack is the Wolf."